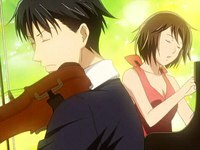 Plot Summary: At a top music academy in Japan, Shinichi Chiaki's arrogance is matched only by his top-notch piano playing. But when Chiaki and the teacher get into a fight, he's demoted to the reject class. Chiaki is left to pursue his dream of being a conductor while surrounded by a bunch of loser musicians and one annoying girl, Noda, who has proclaimed herself Chiaki's girlfriend. It doesn't help that Noda, who insists on being called Nodame, lives right next door to him. ADR Production: Spliced Bread Productions Inc. Licensed by: Deltamac Co., Ltd.